Greetings from Arran, where we are enjoying a balmy 11 degrees C, taking lovely long walks, swimming in waterfalls and taking some down time, before we are back in Portobello and tending to the new shoots there. May is going to be a super busy month (so I hope you are resting well and renewing your strength this week! ), with launch week and the Studio (and my own!) birthdays to look forward to! I’m away for my actual birthday this year- I will be running a half marathon- hence the need for a bit of sneeky extra training this week! Please make sure you have marked (in pen!) the 24th May in your diaries: this will be our birthday party date, which will take place from 7pm at The Grange Club in Stockbridge. If the weather is good on the day, we will also be having a barbecue from 4pm, where children and families are welcome! Please RVSP by emailing me directly on sabrina@phpt.co.uk to let me know if you are planning to attend one or BOTH of these events. Let’s assume the weather will be kind for now, and we can assess the situation nearer to the time. I’ve got more training to look forward to in May in London, as well as in Holland, and the studio will be hosting a Pilates teacher from California, who will be here to meet with and train reformer Pilates instructors, and using our studio as a base. Do say hello if you see her! Don’t forget to book yourself onto April’s Trigger Point Pilates workshop before all the spaces go! Click here to book! Easter and Springtime put us in mind of re-birth and growth on many levels; mirroring the way we grow through the spine to become mentally and physically stronger. Pilates is wonderful for strengthening and recovering from injuries too, and can breathe new life into the spines of people with herniated and bulging discs, for example, by isolating the spine, strengthening the muscles around the spine and improving core stability. This promotes growth through the spine, creating more mobility. In fact, I’ve had a lot of enquiries recently about spinal issues and Pilates, and I am always happy to recommend reformer Pilates for these issues. 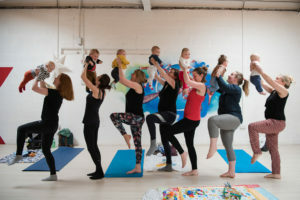 Now is an exciting time for everyone in Portobello, as we move forward with new adventures and learning; and we have lots in the way of new experiences at The Pilates Studio Edinburgh to look forward to this Springtime. I am looking forward to seeing you all in all sessions and classes from Monday 15th including Easter Monday!